August, 2017 – Oakdale, MINN. – Animal Emergency & Referral Center of Minnesota (AERC) recently completed a 17,000 square foot expansion of their Oakdale facility. The team at AERC made the decision to expand the hospital in response to a rise in demand for specialty services and treatment options for pets. The design team at Krech, O’Brien, Mueller & Associates (KOMA) provided architectural, interior design, and structural engineering services to the renovated Oakdale center, which is now home to ten specialties, with room to add more. AERC opened its original Oakdale location in 2000. At the time, it offered only emergency services on nights, weekends, and holidays. In 2009 AERC constructed a new clinic with the help of KOMA, adding a criticalist (specialist in emergency medicine) and as the demand for specialists increased over the years, internal medicine, surgery, rehabilitation, cardiology, dentistry and oral surgery, dermatology, radiology and neurology were also added. The current expansion offers space for staff and patients by including a community room, board room and additional offices. It also allows for specialized medical equipment. AERC selected MRI and CT scan equipment from the human medical field as opposed to veterinary as these provide increased power and better image quality. The installation of this delicate equipment meant special attention to detail had to be paid to the architectural component. “This specialized equipment was a crucial aspect of the design,” says principal architect Steve Iaria, “there are many factors that come into play to make sure this equipment can function properly.” The MRI machine weighs approximately 3,000 pounds and had to be lifted via crane. After it was in place, the last wall of the MRI room was raised into position. Due to the MRI’s magnetic pull, no surrounding components could contain any metal. The MRI also will not tolerate a disruption like shaking or rattling well, so it could not be housed on an outside wall. The CT machine also had a special requirement; due to the radiation emission, the surrounding area necessitated lead shielding. 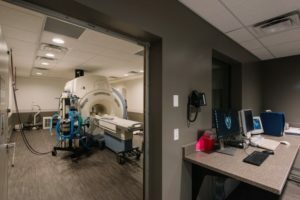 In conjunction with the specialty equipment, the project entailed adding three sterile surgery suites, one of which boasts sterility levels akin to surgical suites in human hospitals. Specialized mechanical systems were also designed to increase the level of air quality throughout the facility. The space planning of the clinic was another critical aspect to the renovation. The intensive care unit (ICU) is located centrally, with anesthesia prep next to it, as well as isolation, labs, and radiology allowing specialists to be close to any lab equipment they may need in an emergency setting. “There is a real need for these specialists, and having a clinic that can function and house specialty equipment and adapt to the changing medical needs is such a large piece of that,” says Dr. Reynhout, the center’s Hospital Director. The project team also included the mechanical and electrical engineers at Emanuelson-Podas and DJ Kranz as the general contractor.